Positioning: Leader in file sharing and backup services. 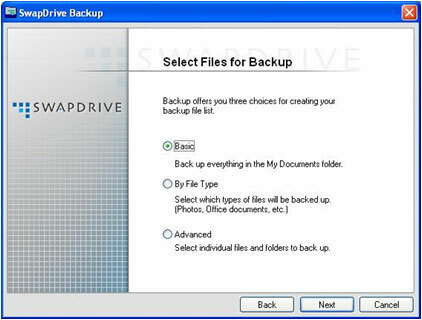 SwapDrive’s services allow customers to remotely backup, store, and access critical information more easily, reliably and efficiently than ever before, with the highest levels of security and availability. We were able to go to their home page and log in. However, we noticed that the default for login is not a secure https link, but rather regular old http — not a good practice. If you want to log in securely, you have to click a “Secure” button as shown below. Problem is, it didnâ€™t work. 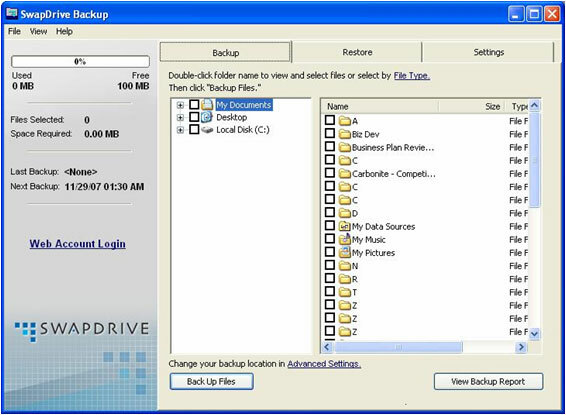 SwapDrive’s backup is fairly simple. Once you have installed the PC software, you have a choice of ways to select what you want to back up. The “Basic” choice, which is probably what most people would choose, would be a lot better if it backed up your whole Documents & Settings folder, not just you’re My Documents folder. The “Basic” setting would miss your desktop and many other settings files that you’d probably like to recover in the event of a disaster. It’s tempting to just want to backup the whole “My Documents” and “Desktop” folders. For this test, we bought the 100MB for $7.50 per month plan. First, beware of security. By default, your files will not be encrypted unless you set that option on the Advanced tab. The interface warns that if you want to access your files using their web interface, the backup can be neither encrypted or compressed. 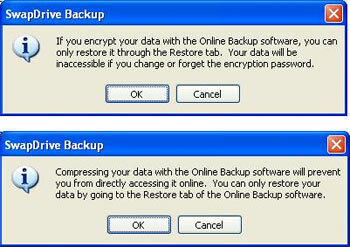 If you are backing up any sensitive, such as Quicken files or email, you would certainly want to turn on encryption. Unfortunately, then, you won’t be able to use the web interface to restore these files. There is also a scheduling screen that lets you select when you want to back up. Scheduled back ups are not as convenient as continuous backup. Some of the services we tested back up continuously in the background, automatically adjusting CPU utilization to whatever else is happening on the PC. The problem with backing up at say 1:30 AM is that you have to leave your computer on and connected. If you get disconnected from the Internet, then your backup doesn’t happen. If you’re traveling, your access to the Internet is unpredictable. It’s nice to know that backup happens automatically whenever you’re connected to the Internet. We don’t know why services like SwapDrive still force users to make these unnecessary scheduling decisions. For my first test, we selected files that totaled 133MB– more than my 100MB quota. Sooner or later, you’re going to add enough files to your backed up folders that you will hit the quota, so we wanted to see what happens. Neither the error message or the error log explained that the error was due to being over quota, however. We tried again and this time it worked. When SwapDrive came to a file that would put the user over quota, it would try to backup that file four times (with pauses of 2, 8 and 32 seconds between retries), then go to the next file; this continued until it found files small enough to fit in the remaining space. The problem with this is that the user would really have no idea what was backed up and what wasn’t unless they went and looked. Once the backup went over quota, the status window froze. There were no changes over several hours. However, Windows Task Manager did not show the application as “Not Responding”. The application just sat there until we killed it. We reduced the size of our backup set so that it was less than 100MB. This wasn’t so easy because the client did not update the “space required” number. 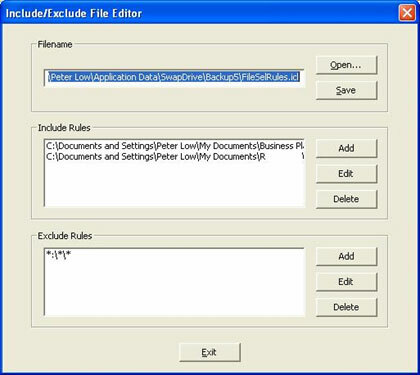 Restarting the application, however, produced the right number and the backup appeared to have completed successfully. The “thermometer” indicated that we had backed up 104% of quota. However, the file was not actually backed up. The drag and drop interface worked as you would expect, except that it didn’t work with Firefox. PC Magazine reviewed SwapDrive in 2004 and gave them 3 ½ stars out of 5. In 2004 this was probably a fair evaluation considering that current market leaders Carbonite and Mozy weren’t even around back then. Today their product doesn’t stack up quite so well any more. On the plus side, SwapDrive has been around for at least 7 or 8 years, so the service is mature enough that it ought to be pretty reliable. We didn’t get any hint of instability in their server software. However, since it has been around for a long time, it’s starting to look a little long in the tooth compared with some of the other services we tested. Also we wouldn’t be surprised if they had a relatively high cost infrastructure based on technology designed many years ago. That’s only speculation, however. On their website they allude to redundant data storage– if they really mean a second copy, this is not a very cost-effective way to achieve high reliability. We haven’t heard of most of these, but you can chase them down on the web if you’re interested.